Observed at night on a smooth-barked tree. Upper Kerio Valley, Elgeyo-Marakwet, Kenya. Dec. 2015. Natural habitats in the tropics are home to thousands of cockroach species - mostly very different than the few species that have taken up habitation with humans. 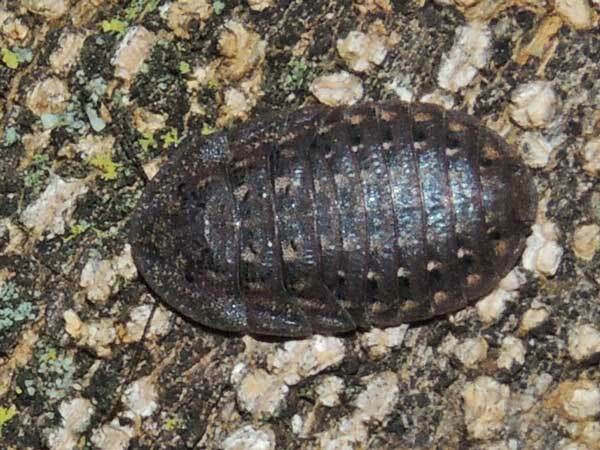 The specimen here is an adult female that is wingless. It is strongly compressed dorsal-ventrally and is able to cling tightly to its substrate. I suspect that insect predators have a difficult time handling this cockroach. The defensive technique is similar to a diverse array of animals, big and small. The males of this bark cockroach are probably winged and likely to behave very differently.